Jeff Richmond, 21, of Tampa, Fla. (the corps' drum major, in his fifth year), said, "I tough we had a great show tonight. We are much more mature this year, and we seem to be progressing a very steady level, so I think we are really where we need to be at this point." Personally, Richmond was pleased with his own performance. "I think I had a good show, we have a lot of really timing sensitive parts in our show, that require a lot of communication between the drum major and the drum line, and I think we are really starting to solidify those elements in our program." Richmond also elaborated on his favorite segment of Spirit's 2003 program. "We have a part of the show where we kind of let back and it's kind of in your face, the horn line can really just sit back and jam for a little bit. I really enjoy that part of the show and I think the audience does too." 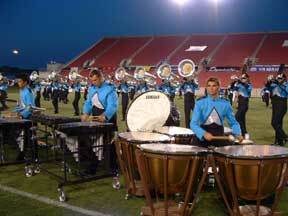 Papa John's Cardinal Stadium is likewise an optimal setting for a drum corps show, according to Richmond. "That kind of stadium is fun to play in because there are more people, a bigger crowd, a taller box. But it also creates some other issues -- like on the field, there is a different type of echo, so for the performers actually on the field, it creates some timing difficulties initially. If they are listening at all, they have to turn off their ears and just watch."